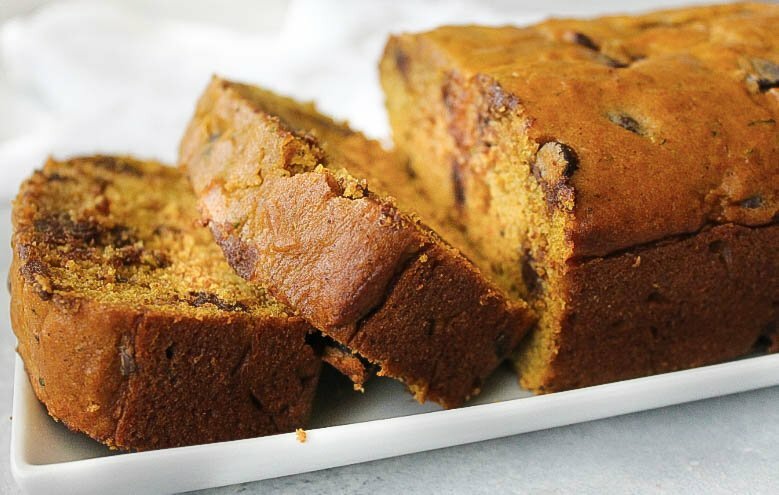 This Pumpkin Chocolate Chip Bread is a fall staple. It is so moist and easy to make. 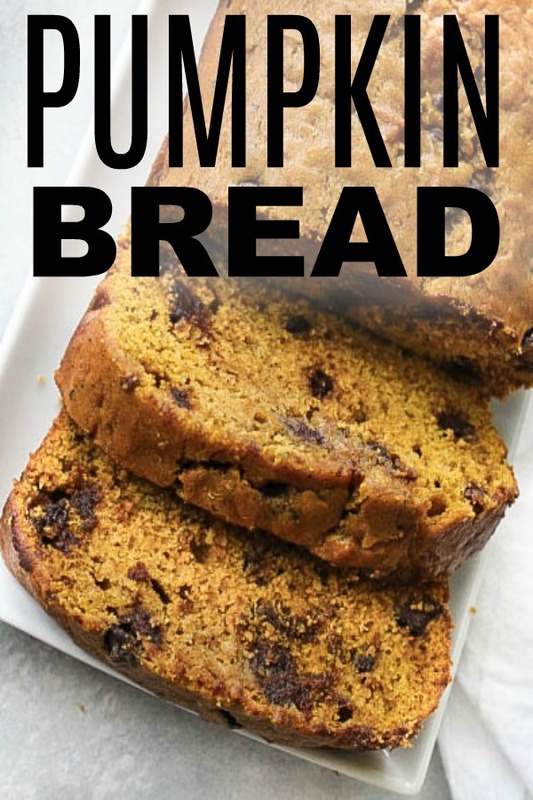 It also has two secret ingredients that make this Pumpkin Bread the very best. This secret recipe is a must try. 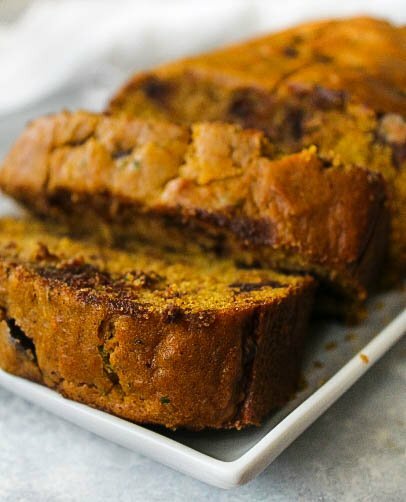 We never get tired of delicious pumpkin recipes and this pumpkin chocolate chip bread ranks right at the top. You’ll love this recipe because it makes 2 loaves. One loaf for you and one to give away, or better yet, 2 loaves for you. It’s that good. Step 1: Heat oven to 350 degrees. In a large mixing bowl combine pumpkin, eggs, sugar, brown sugar, oil, sour cream, cinnamon, nutmeg, cloves, vanilla, orange juice and molasses. Step 2: Stir until well blended. Step 3: Add in baking soda, baking powder, salt, and flour. Step 4: Stir in just until combined. Then fold in all but 1/3 cup of chocolate chips. Step 6: Pour batter into both pans. Sprinkle extra chocolate chips on top of both loaves if you need more chocolate. Step 7: Cook for about 40 minutes. Step 8: Cover both loaves loosely with aluminum foil and cook for another 10 to 15 minutes or until a toothpick inserted comes out clean. Step 9: Remove from oven and let set in pan for about 10 to 15 minutes. Step 10: Then invert to a wire rack to finish cooling. **This recipe can also make 6 mini loaves of bread. Cook the mini loaves for about 40 minutes. If you don’t have a loaf pan, or you are taking your bread to a party, you could also make the into muffins. The best part is, you don’t even have to line the muffin tin with cupcake liners, instead, you could grease the pan with non-stick cooking spray. If you would like to use cupcake liners for decoration that is also an option. I used Halloween cupcake liners when I made these for a Halloween party. To make them in a muffin tin, spritz each muffin tin hole with non stick cooking spray. Add 1/4 or 1/3 cup of batter to the hole. Bake for about 20-22 minutes at 350 degrees. As you read through the ingredients, you’re probably asking if we meant to put molasses and orange juice on the list. The answer is yes. We did. The molasses gives the bread a sweet taste, while the orange juice gives it just the perfect amount of zing. You could easily go without these two ingredients, however we highly recommend them. If you aren’t an orange fan, don’t stress, you can’t even taste the orange juice. The citrus just adds a little zing to the bread that you can’t quite identify. You could also use the juice of a fresh orange, if you don’t have a bottle of orange juice on hand. I’m not a huge vegetable oil fan. However, this bread works great with vegetable oil. If you are like me and want a substitute, we recommend substituting avocado oil or coconut oil with this recipe. We wouldn’t recommend olive oil as much as the other two, but it would still work. Olive oil has a very distinct taste when you use it in sweets and baking. However, with the chocolate chips, you won’t be able to taste it as much. If you do use olive oil, we recommend using just a dash more of cinnamon, nutmeg and cloves. We have hundreds of simple and delicious family recipes on our Youtube channel. 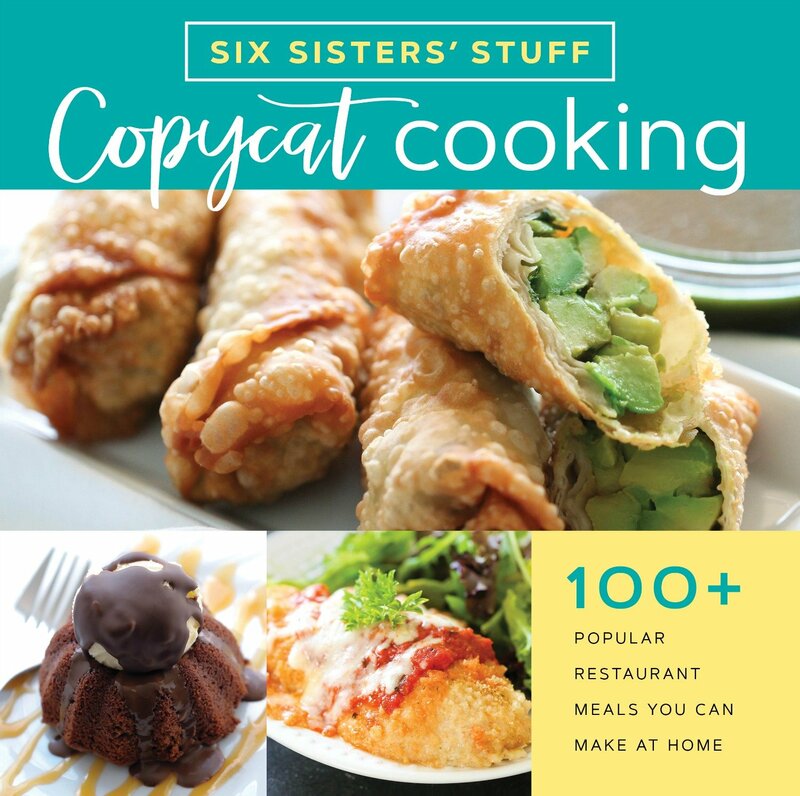 Each recipe is tried and true. We take you through each recipe, step by step, so you know exactly how to make it. Love Pumpkin Desserts? These are some of my favorites! 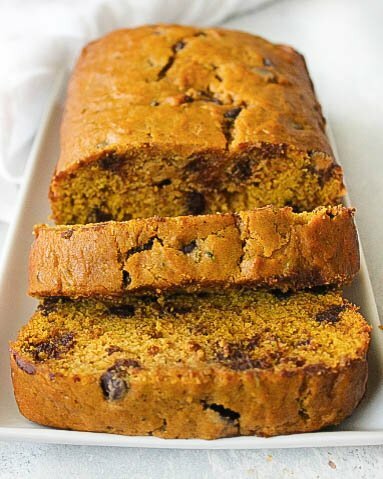 This pumpkin chocolate chip bread is so moist and easy to make. This recipe makes 2 loaves. In a large mixing bowl combine pumpkin, eggs, sugar, brown sugar, oil, sour cream, cinnamon, nutmeg, cloves, vanilla, orange juice and molasses. Add in baking soda, baking powder, salt, and flour. Stir in just until combined. Then fold in all but 1/3 cup of chocolate chips. Pour batter into both pans. Sprinkle extra chocolate chips on top of both loaves (optional). Cover both loaves loosely with aluminum foil and cook for another 10 to 15 minutes or until a toothpick inserted comes out clean. Remove from oven and let set in pan for about 10 to 15 minutes. Then invert to a wire rack to finish cooling. How long do you bake them for if you do muffins instead? Can I do something other than orange juice? I hate oranges. Hi Kendra. You can totally leave this out and it will be fine. But you can't taste the orange juice at all if you leave it in. Thanks for stopping by our blog and have a Happy Thanksgiving! Can you leave out or substitute the molasses with something else? You could just leave it out if you don't like molasses. Hi! i like to use coconut oil instead of vegetable oil when I bake. Would this taste weird with the orange juice and molasses? Have you tried tried it ieth coconut oil o before? Hi Sarah. I think you will be fine with the coconut oil. We have not tried coconut oil with this recipe, but it sounds like you substitute it for vegetable oil often. The orange juice and molasses is such a small amount that I think the taste of everything will be fine.